Leaderless: The asymmetrical bootstrapping starfish and the chronically arthritic spider. As a companion philosophy to The Wisdom of Crowds we now have The Starfish And The Spider; the unstoppable power of leaderless organizations. Evidently, the U.S. military is studying small companies to unearth ideas that will help the war on terror. ...How large, traditional companies fare in this fight may prove invaluable in developing a strategy against al-Qaeda. That's why the military is going to school. 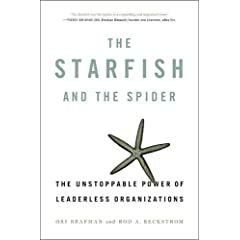 A book making the rounds at the Pentagon is The Starfish and the Spider: The Unstoppable Power of Leaderless Organizations. It was written for a business audience, but military strategists are saying, "This is the best thing I've read that applies to counterterrorism," says Lt. Col. Rudolph Atallah, a Defense Department director in international affairs. Via Catrina.net: Leaderless Startups, The Starfish and the Spider. Linda recommended The Starfish and the Spider , subtitled "The unstoppable power of leaderless organizations." This idea will be familiar to many of us who've been watching open source, wikipedia, and other decentralized online phenomena, but I found that the most interesting parts of this book were about the offline world, and how leaderless organizations have succeeded there. The Starfish and the Spider explores what happens when starfish take on spiders (such as the music industry vs. Napster, Kazaa, and the P2P services that followed). It reveals how established companies and institutions, from IBM to Intuit to the US government, are also learning how to incorporate starfish principles to achieve success. Earth Intelligence Network (EIN), a non-profit with 501c3 status pending exists to provide social intelligence capital by harnessing the distributed intelligence of the Whole Earth and creating a new integrated global mesh that enables life-long education, decision-support, focused research, and consensus-building. 1) To create, structure, and share public intelligence in the public interest with respect to the ten high-level threats, the twelve integrated policies to address all threats, and the eight major players whom we must help avoid the horrendous mistakes associated with immoral capitalism and unilateral militarism. 2) To support, at no cost to them, all developers of serious games and games for change that address any or all of the ten threats, twelve policies, and eight major players. Hmmm. Distributed network of decision makers that operate on their own but towards a communal interest? Seems just like Patrick Byrne of Overstock.com.com.com is talking about with strategic failure to deliver. The enemy of my enemy is my friend. It's no real stretch of the imagination to see why distributed, unorganized networks of a like mind are so difficult to defeat. Napster was able to be targeted only because they controlled the linchpin of having the network traffic go through their servers. Everyone is wanting to do the 'user generated content' thing. Newer PostTrolley Square shootings in Salt Lake. Older PostNiche Blogging: Designing a niche for the non blog savvy.